Hello Fresh, Graze and Simply Cook all offer us consumers a quick way to eat well and, having tried each of them I can't fault any of them. But, there is one issue that they have is that you are required to cook (or just Graze). Now I love to cook don't get me wrong, but sometimes, when the day has been long, you feel ill, tired or simply worn out its far easier to pick up a takeaway or put in something that's already made and can heat and eat quickly. And that's where Thyme comes in. Yes it's another box aimed at foodies but this time its cooked food that's frozen and ready to simply be warmed up. I absolutely love these types of boxes, especially the ones that are filled with amazing home cooked meals, and let me tell you, the Thyme box is one of them! The problem with ready meals these days is that they look unappetising and are mostly filled with salt and are generally unhealthy. 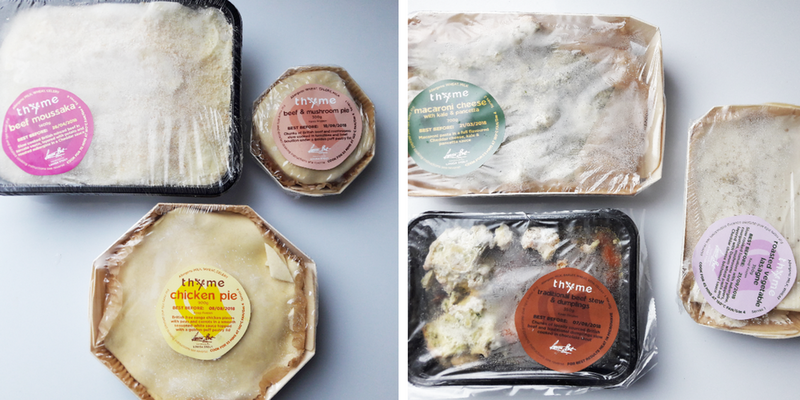 However, when you get your Thyme box, you will quickly see that not all ready meals have to follow this trend. The Thyme website describes this dish as a "locally sourced British beef, slow cooked in a velvety chocolate stout to ensure a full bodied, rich flavour that's hard to beat" and I agree fully! The beef is very tender, as expected from a slow cooked meat, and the portion is very generous. I'm not a huge fan of dumplings, however, coupled with this beautiful stout based sauce they were very tasty! Ingredients: Herefordshire beef, water, carrots, chocolate stout, barley, dumplings, onions. This is not your regular Macaroni, and if you aren't very hungry then you will most likely be saving some for later as it is very filling! Unlike standard mac & cheese, this has a really luxurious feel to it and is a bit posh mostly due to the kale (super food of 2016) and pancetta. I really love the combination of the Kale & Pancetta because it gives what would be an overly savoury dish, some freshness and moorishness. Ingredients: Semi-skimmed milk, macaroni, cream cheese, Smokey bacon lardons, spinach, butter, flour, cheddar cheese, kale. Thinly cut potatoes, tomato sauce, aubergine, cheddar cheese and British beef - what's not to love. It's a warming dish and perfect for this icy cold weather. Nothing better than wearing your cosy PJ's and having a home cooked, filling meal to end your weekend. Ingredients: British beef, potato, aubergines, tomato, onion, cheddar cheese, beef bouillon. These are suitable for one person so you'll have to fight over who gets what pie. Connor got this one, and thoroughly enjoyed the beef inside which you'll find is substantial given the size of the pie. The one disagreement we both had with this though is that it doesn't have pastry on the bottom - I believe a pie should have pastry on the top and the bottom, Connor was neither here or there and just enjoyed the dish. Ingredients: Herefordshire beef, flour, onion, mushrooms, butter, tomatoes, beef bouillon, tomato puree. Again much like the beef and mushroom version, this is a one person pie. It has chunks of real chicken in a creamy sauce with peas and carrots. It really is perfect and tastes home made. I love a good chicken pie, but find many frozen options contain very little chicken or filling inside. This one however is small but mighty and will keep you filled up for hours. Rich lasagne filled with vegetables. The pasta tastes fresh (even though its clearly frozen) the vegetables and sauce also taste as though they were just made. I'm not big on tomato based pasta dishes but this was absolutely amazing, Connor also enjoyed this and he thinks meat should be in every dish. Ingredients: Tomatoes, milk, lasagne, aubergine, courgette, red, yellow and green peppers, mushrooms, flour, butter, cheddar cheese, tomato puree. Which of the above meals would you choose first? Overall we were both really surprised at the quality and how tasty each meal was. The company promotes themselves as being more natural as they don't use preservatives and other nasties and they thoroughly proved that fact to us with these meals. If you want to check out what they offer you can do so over on the Its Thyme website.